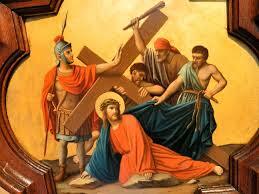 The Third Station of the Cross – Jesus Falls the First Time – can be unsettling. Jesus falls. How can that be? He’s God. God isn’t supposed to fall. But he’s also Man, and he suffers all the pain and frailty that any other human does. Like me. Like you. Jesus’ fall is about more than succumbing to the weight of a cross. It’s about succumbing to weakness of any kind, especially in teh spiritual realm. Jesus, by his incredible example, is showing us that there’s no shame in falling. There’s only shame in not getting up again. When we refuse to get up, we’re refusing God’s help. We’re refusing his mercy. And that’s the part that’s shameful. As you pray this Third Station, you might think of a time you’ve fallen and struggled to get up. Perhaps you’re still struggling to get up from a fall. Ask our Lord to show you, to help you, to get up again. Jesus Is Mercy Incarnate. But, Who Gave Him His Body? What Do You Do When There’s Nowhere Else to Turn?